The Blackwell Inn was a big lavishly decorated hotel, and the conference was held in the ball room. I saw Steve Kuusisto moving up to the podium and talking to his dog “Come on, girl.” Moving in unison with the dog up to the podium. He introduced himself, his guide dog Nari, (Who “by the miracle of frozen sperm” is from his last dog), and began to explain disability as a mode of perception. The ability to re-claim “embodiment” (How our bodies are perceived.) is as ancient as language, he argues. Steve was funny, articulate, and poetic. 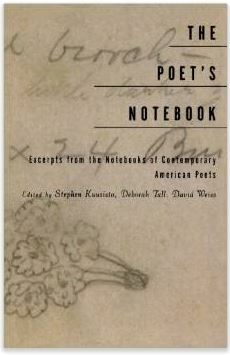 Frequently, he made allusions to other poems, or modes of perception that “re-claim embodiment.” That is, he examined the inner world of disability, its lived experience, in contrast to being defined as reified (lacking. Blindness being the absence of light. Deafness being the absence of hearing, etc. In his poetry, he describes his dog as being much more than a dog; that sometimes they are one being. This is actually how I feel about my wheelchair too. He tells stories of watching drunken men in wheelchairs eating flowers, and wrote about that poetically. 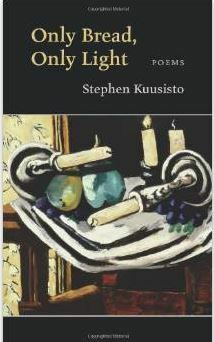 Through poetry, Steve gains insight and a unique epistemology. 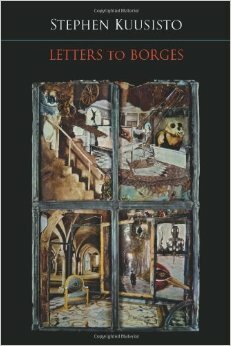 Continue reading post on Christopher Bowsman’s blog, Through Alien Eyes, The Sci-fi Worldview of Chris B. Insights from the Planet of the Blind: An Interview. Part 1. After reading Planet of the Blind, Kathleen Avery, Senior Director of Marketing at Cleinman Performance Partners, had occasion to talk with the author (Stephen Kuusisto) about his story and all that he’s come to understand. Thank you, Kathleen, for allowing us to share this with our readers. Stephen: Well, the first answer to that question is about language. All nouns are images. If you say strawberry…or horse…or wheat field…or lighthouse in Maine – you automatically see these things in your mind. This is why ancient people believed that poets were magical. They could make you see things.. They once had a radio advertisement on NPR: “Listen to the Theater of your Mind.” That’s how poetry works. It throws off powerful nouns and the reader sees them; they’re called power nouns. Kathleen: But how do you know what a lighthouse in Maine looks like? Stephen: I either do or do not (laughs). And that’s the second answer. There is a way in which imagination approximates things. You can actually create things with language that don’t exist. The poet Charles Simic says, “Go inside a stone, that would be my way…” He takes you inside the stone and it is the universe all over again. The truth is you can’t see that at all, but you can trick the mind into seeing what can’t be seen. This is also why ancient people thought poets were magical. And, of course, people describe things to me. You know, people think that blindness is like living in a vacuum. The general public tends to think that blind people are trapped inside the stone. They will ask me how I could possibly go to an art museum. Well, you pick your friends. You go with friends who will describe what they see. Is it an immediate experience? No. But I like it, because there is poetry in it. It is mediated. Kathleen: Oh, how interesting would it be to listen to different people describe the same Picasso? Stephen: That would be a fabulous NPR piece! No one knows when the forerunner of today’s guide dogs first appeared. Drawings of blind people accompanied by dogs date back to the 17th century. Those early pairings were most likely memorization teams, one pictures the dog leading its partner through the village square. It’s clear no substantial training was involved. But we can imagine the tremendous bond with dogs that developed between the uncharted and lonely blind people of prior ages. It is a safe bet that dogs solved the puzzle of solitude for blind travelers who lived in a time when sightlessness was a great calamity. (The idea that blind men and women could be taught to read was a late development in cultural history, as Diderot’s essay Lettre sur les aveugles published in 1749 offered the first speculation that raised letters might be possible.) The world of the blind has been a dismal place throughout much of history. It’s possible to say, along with the poet Pablo Neruda that pure faith cannot withstand the assaults of winter, but your survival is more likely with a dog. Sometimes when I think about the ancient blind with their lives of begging and fiddle playing, their relentless wandering, homelessness, sickness, I weep to imagine the righteous loyalty of those early dogs. Back in 1998 a book reviewer at The Boston Globe suggested that I am a shill for the guide dog schools. 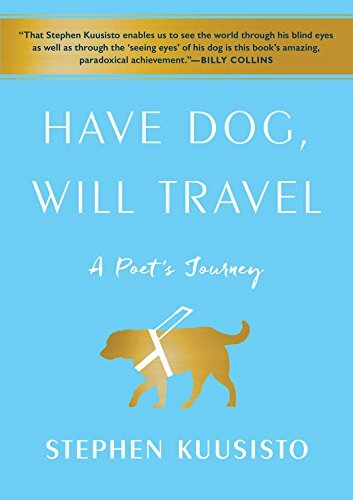 What he meant is that my first book of nonfiction is richly devoted to sharing the experience of training with my first guide dog “Corky”—a life changing event for me and the glue that holds together my book. I didn’t mind being called a shill. I’ve been called worse. Today as I was walking in the Iowa snow with my third dog from Guiding Eyes I remembered that old Steve Martin joke where he says to his audience “I want to thank each and every one of you” Then he proceeds to say over and over: “Thank you thank you thank you thank you” etc. Occupied in this way it dawned on me that Guiding Eyes for the Blind is worthy of every thank you I could pronounce. Guide dogs are expensive creatures to breed, raise, train, and then pair with a blind person. Despite the fact that each dog and person team costs well over 40,000 dollars to create, Guiding Eyes absorbs all the costs through its non-profit program of charitable donations. I am a comparatively lucky blind person. I have a good job and a wonderful wife and family. Yet I can assure you that if I had to pony up 40K for my street mobility would be very hard pressed indeed. This in turn gets me to my point. Some will doubtless think of me as being too sentimental. Thanking those who have helped you is perhaps, in the minds of some “too old fashioned” or “too caught up in the charity model of disability”. I believe that as I walk safely and in most cases euphorically that I have a big team behind me. Donors, puppy raisers, puppy breeders, veterinarians, fund raisers, construction and buildings and grounds personnel, volunteers, guide dog trainers, orientation and mobility specialists, dietitians, nurses, folks who work in the kennels, and the blind men and women who have trained alongside me with their new dogs. Today, walking in the snow I heard in memory the voice of Steve Martin thanking everybody. Oprah, If Only You Had Read the Book! 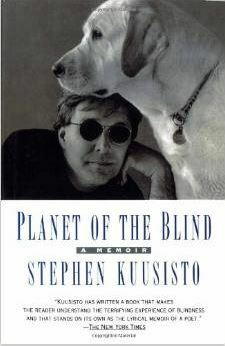 In 1998 I published a memoir entitled “Planet of the Blind” and much to my delight some good reviewers praised the book. 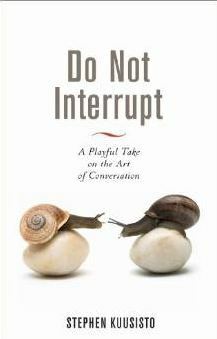 The memoir received strong reviews in The New York Times and USA Today and suddenly I was invited to be a guest on National Public Radio’s superb program “Talk of the Nation”. This was heady stuff for a guy who had been writing poetry for 18 years. In the poetry world you are very lucky if you have a hundred readers and let me tell you, 100 readers is pretty much beyond the wildest dreams of most of the talented and deserving poets I’ve met along the road. Each time something good happened where the book was concerned my wife would say, jokingly, “Yeah, that’s great; just let me know when Oprah calls” We would chuckle about that. The reason we’d laugh about Oprah is that “Planet of the Blind” is not the kind of book that haunts the bestseller lists. The book isn’t lurid; it’s not angry; it doesn’t even have much of a plot. In fact it’s such an odd book that it’s difficult to describe. 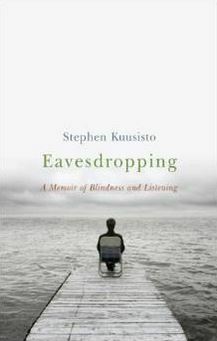 It’s in part a history of blindness in America and part a “coming of age” story by a writer who largely grew up feeling ashamed of his blindness. The story isn’t particularly unusual and even worse from a sales standpoint; I have an addiction for big words. After two canceled flights and a long day’s journey I arrived back at Guiding Eyes for the Blind last evening. I’m embarking on a fabulous adventure, training with a brand new guide dog. In twenty minutes I’ll be heading to my first full day of training–a humbling process for although I’ve had two previous guide dogs, the training has evolved and the dogs nowadays are trained to follow some new commands. Can an old blind guy learn new tricks? We shall most certainly find out. Guiding Eyes is one of the nation’s premier guide dog training schools and my wife Connie and I used to work here before we moved to Ohio and then westward to Iowa City. The school has undergone some significant changes since Con and I were last here in 2000, most notably there’s a brand new student residence and a fabulous new dining hall and a beautiful new multi-purpose room for classes and events. There’s also the "march of time" because of course the new guide dog trainers are ever younger. And they have new training techniques and I already feel like a slightly disreputable uncle whose manners need to be seriously improved. As always, the other students come from every corner of the United States and they are made up of new guide dog users and old timers; young folks and those of us who are middling old. There’s a nice camaraderie and I know I’ll be hearing all kinds of disability related stories over the next 10 days. I’m immediately reminded that disability is entirely democratic in its discriminations: we are a diverse group from all kinds of backgrounds and we have only blindness in common. And soon we shall have dogs in common and that’s a beautiful fact. We will get our new guide dogs on Wednesday. I got my first dog "Corky" when I was 39 and now I’m 52 and the veteran staff keep telling me that I look good and haven’t changed and aside from the decency of that premise, maybe in a small way I’m lucky to have had two good dogs to work with and travel alongside as a principle means both of being safe and staying young. Dogs after all are important for human physical and emotional well being. I must go now into the busy day with its lessons and unimagined astonishments. Here’s to the good dogs and their human pals.